The bladder-like galls produced the Sumac Gall Aphid (Melaphis rhois) on the leaflet midveins of its namesake host are almost fully expanded in southwest Ohio. They currently measure between 1/2" to 1" in length; however, despite their size, their light green color can make them difficult to detect. This will change as the season progresses. The galls will eventually become variegated with areas that are greenish-white bounded by areas that are mottled reddish-pink. The starkly contrasting colors will make the galls very evident. The online literature indicates smooth sumac (Rhus glabra) and staghorn sumac (R. typhina) are primary hosts, if not the only sumac hosts. 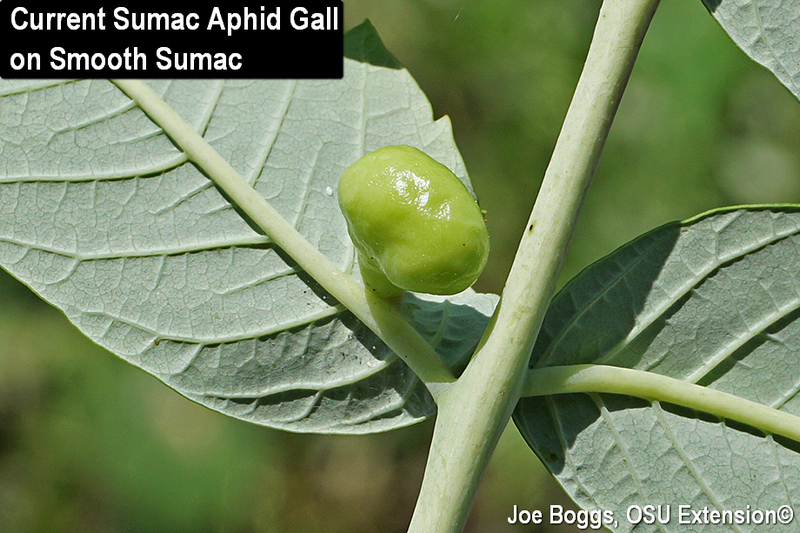 Of course, as with the vast majority of insects that produce plant galls, the sumac gall aphid appears to cause little injury to the overall health of their host plants. Although heavy galling may cause early coloring and shedding of some sumac leaflets, the overall impact appears to be inconsequential relative to plant health. The aphid has a complex life cycle with summer generations producing galls on sumac and winter generations living on mosses beneath or near the sumac. Females released from the summer galls drop onto moss where they reproduce asexually and the subsequent generations survive the winter. Males and females arise from the moss colonies in the spring with winged, mated females flying to sumac where each female lays a single egg. The egg hatches into a "stem mother" which initiates gall formation and gives rise to a series of parthenogenetic (without males) generations that proliferate inside the gall. The galls eventually split open in the fall to release winged females that drop onto moss starting the alternating moss-sumac host cycle over again. I first wrote about the sumac gall aphid in a BYGL report in 2014. The report drew the attention of Zhumei Ren (School of Life Science, Shanxi University, Taiyuan, China) who was doing research on prehistoric connections between gall-making aphids on sumac that are found in Asia and North America. She visited Ohio in 2015 on an aphid gall collection trip hosted by Sue Lutz (Botanist, Smithsonian National Museum of Natural History) that was funded by the Museum's Global Genome Initiative. To read more about Ren's collection trip, click on the hotlink "Collection Trip" under "More Information" below. Research had clearly shown that our native sumac gall aphid, Melaphis rhois, and the Chinese sumac aphid, Schlechtendalia chinensis, are "biogeographically disjunct" Asian and North American species meaning they are related, but separated geographically. Indeed, Ren's research showed our native aphid's mitochondrial genome (mitogenome) is identical to that of the Chinese aphid which begs the question: just how "native" is our native sumac gall aphid? A phylogenetic study Ren published in 2013 indicated that the biogeographical break occurred sometime during the Eocene–Oligocene boundary approximately 33 to 35 million years ago which coincides with closure of the first land bridge across the Bering Sea which is known as the Beringian Land Bridge I. Other research has shown that the break between Asian and North American sumac host species occurred at the same time [see "2013: Historical biogeography …" below in "More Information"]. However, based on aphids Ren gathered in Ohio and elsewhere in 2015, a further phylogenetic study she published in 2017 showed the North American gall aphid genus, Melaphis, diverged from its Asian relatives much earlier. It looks to have happened around 64.6 million years ago during the early Paleogene Period in the Paleocene Epoch [see "2017: Another look …" in "More Information" below]. Alert readers will recognize the timing shown by Ren's phylogenetic study is very close to the mass extinction event that occurred around 65 million years ago that marked the end of the Cretaceous period as well as the non-avian dinosaurs (the so-called K-T Boundary). While the exact chain of events causing the demise of T-Rex remains hotly debated, there is no doubt a meteor impact played a key role. The meteor muddled-up more than just reptiles. Owing to continental drift, Earth's land masses were aligned differently 65 million years ago. North America was strongly attached to Asia by more than just a land bridge across the Bering Sea. There is no doubt many insect-plant relationships were shared between the two continents. However, the mass extinction radically changed things [see "2002: Impact …" in "More Information" below]. The meteor impact appears to have scrambled the phylogenetic record in such way that science may not be able to untangle the exact historical relationship between our sumac gall aphids and those found in Asia. At least, that's a conclusion Ren and her co-authors presented in their 2017 paper. Of course, if Ren's research thus far teaches us anything, it's that science does not stand still. And, lessons taught by the sumac aphid is more than gall deep.